How Do You Justify Consuming ExxonMobil's Oil? The 2009 Copenhagen Accord on climate change stipulated that if the worst impacts of climate change are to be avoided, we have to stop taking fossil fuels from the ground and burning them. Doing so has been increasing the carbon dioxide in the atmosphere for the past two centuries. Former Vice President Al Gore has been but one high profile voice advocating for leaving those fossil fuels in the ground, which would create a big problem for fossil fuel companies whose value is based on their fossil fuel reserves. Gore outlined his position last year in a Wall Street Journal editorial The Coming Carbon Asset Bubble. This is obviously an item of significant interest for fossil fuel companies and their shareholders. In fact, in February several investor groups filed shareholder resolutions with 10 fossil fuel companies, including ExxonMobil (NYSE: XOM), Chevron (NYSE: CVX), Devon Energy (NYSE: DVN), Kinder Morgan (NYSE: KMI) and Peabody Energy (NYSE: BTU), seeking an assessment of how they are preparing for the possibility that some of their fossil fuel reserves may become stranded under a low-carbon scenario. ExxonMobil responded to these resolutions with a 30-page report. The company indicated that its investment decisions are based on a comprehensive annual analysis of the global outlook for energy that is consistent with the International Energy Agency’s (IEA) World Energy Outlook and the US Energy Information Administration’s (EIA) Annual Energy Outlook. In other words, investment decisions are not simply based on the world according to ExxonMobil, but also on the world energy outlook from the US government and the IEA, which represents 28 member countries (including the US). The report states that ExxonMobil takes the threat of climate change seriously, a point reiterated by ExxonMobil government affairs chief Ken Cohen in an Associated Press interview following the paper’s release. “We know enough based on the research and science that the risk (of climate change) is real and appropriate steps should be taken to address that risk,” Cohen said. I am not going to get into the gist of the report here, except to summarize ExxonMobil’s position, which is: “World demand for oil will continue to be very strong, and our oil reserves will not be stranded.” If you want to know the basis for their argument, it’s laid out in the report. With all due respect, that might not have been the question you asked, but if ExxonMobil doesn’t believe it’s a credible scenario, then they aren’t going to spend a lot of time and money addressing it. As an example, how much time do you spend each day planning how you will spend your lottery winnings? If you aren’t spending any time, you will be totally unprepared for winning the lottery. Oh, you don’t spend that much time on it because you don’t believe the outcome is likely? You may fantasize about what you would do if you won the lottery, but you don’t spend a lot of time each day making financial plans based on that outcome. Likewise, I can assure you with 100 percent certainty that ExxonMobil is spending some efforts on alternatives to oil. It’s not a lot relative to their overall business, but it’s relative to how likely they think demand is shifting away from oil. And if demand starts to shift, they will shift their spending to try to capture where the markets are headed. That’s how oil companies operate in the real world, and not in the cartoon world many people think they inhabit. People view them through different lenses and see their own projections, but the reality is that ExxonMobil has seen a future in which oil continues to be the basis for transportation (as does the EIA and IEA), and they have been correct in that view since they have been in existence. But that doesn’t mean they can’t change. It just means that the catalyst for change isn’t necessarily YOUR view that their oil reserves will be stranded. Which brings me to my final point, which is reflected in the title of this essay. With some extremely rare exceptions, the people who brought those resolutions forward that demanded to know how ExxonMobil would cope with leaving their oil reserves in the ground – all of them use oil. My point is not to argue hypocrisy, but rather the cognitive dissonance at play. Those of us who are concerned about climate change – and I include myself in that group – all justify our consumption of oil in different ways. We either reason that our individual contribution won’t make that much difference, and what we would have to sacrifice to live without oil isn’t proportional to the miniscule impact on the environment from our single contribution. Or, we reason that we do what we can to minimize our personal consumption, but by using oil to travel around to urge others to limit consumption (the Al Gore/Bill McKibben sort of justification), our net impact will be lower oil consumption. The thing is, ExxonMobil can argue exactly the same points. First of all, oil is a very small contributor relative to coal (and coal consumption is for me a very different argument), and ExxonMobil is a small percentage of global oil production. So ExxonMobil can make the argument “our impact just isn’t that great”, just as individuals do. But oil also has few viable substitutes relative to coal. So ExxonMobil can reason that their relative contribution to climate change is very low, while the impact of affordable transportation for people is great. They can further argue (and did in the response to the shareholder resolution) that they are doing what they can to lower their environmental impact. So just keep in mind that if you want to press ExxonMobil to leave their oil in the ground, you are on thin ice when it comes to arguing why it’s then OK for you to use the oil they produce. If you use oil, you are part of the reason ExxonMobil continues to profit from producing the oil. If you really want them to leave their oil in the ground, convince everyone to stop using it, and do so yourself. Then the asset will be stranded. But you aren’t going to have much luck stranding the asset when demand continues to grow. Every time you justify your oil consumption, ExxonMobil justifies producing more oil. But as my friend Geoffrey Styles points out in his take on the issue, ExxonMobil does model “its projects and acquisitions at proxy costs of up to $80/ton of CO2, compared to current levels of $8-10/ton in the EU’s Emission Trading System.” And even though they believe governments are unlikely to adopt such high carbon prices, even 10 times the current value of carbon dioxide emissions in the EU is unlikely to strand Exxon’s petroleum assets because there just isn’t a good substitute. In my view, the relative benefit of future oil consumption is far greater than the relative benefit of future coal consumption, because oil has fewer potential substitutes. There are many different ways of producing electricity at a price that is competitive with coal, but with lower emission of carbon dioxide. In a low carbon emission scenario, the lion’s share of the reduction effort should be directed at coal. Coal is a much larger relative contributor, and there are potential replacements. Thus, I think ExxonMobil gave a reasonable answer in saying that it has looked at the risks, and doesn’t believe any of its reserves are likely to be stranded. There are no alternatives capable of supplanting oil as the main global transportation fuel in the foreseeable future. There will continue to be contributions from biofuels, and electric transportation will continue to make inroads, but crude will continue to do the heavy lifting. Link to Original Article: How Do You Justify Consuming ExxonMobil’s Oil? First they came after coal, but I wasn’t coal, so I did nothing. Then they came after oil, but I wasn’t oil, so I did nothing. Then they came after natural gas (me) and there was no one left to defend me. You just need to point out that it’s not greens or Big Government that’s killing coal, it’s cheap fracking gas. But don’t stay up all nigh worrying about the coal industry, they’ve discovered the Chinese market. that are killing coal, but the greens and EPA took a big step forward today. Wow, Nazi comparisons–classless. Talk about a distorted view of reality. Patience, grasshopper, and watch the future unfold. The ultimate goal is zero CO2 emissions, which means all fossil fuels are in the fe(de)ral government’s sights. Note the federal attitude toward oil and gas E&P on federal lands. What is the present scientific justification for any $/ton cost on CO2 emissions? Even the IPCC admits that climate sensitivity to CO2 has never been quantified accurately. If the current level in the EU’s ETS is $8-10/ton, this can only be based on politics, not science or economics. And since any cost can be justified politically, $80 or $800 is exactly as rational as $8/ton. What the green left wants is the power to destroy corporations at will. A key step toward that power is to get corporations like ExxonMobil to acknowledge that the value of their assets is under political control. It’s encouraging to see that ExxonMobil is not dumb enough to fall for it. The climate in Mid-Michigan today (April 15th) includes a high temperature of 34F and a light coating of snow on the ground. No sign yet of the “heat death” that the green left has been prophesying for decades. It almost makes me wish we could go back to the 1930s, when CO2 levels were lower, and temperatures were warmer. When your insurance company declares your car “totaled” and cuts you a $7,480 check, that is not a perfectly accurate amount to cover your loss, but it’s acceptable. That’s the same idea behind a carbon tax. The amount should be high enough to incentivize GHG reductions without totally wrecking the economy. It won’t be perfect, but it should do the job well enough. The latest IPCC report estimated that worldwide economic growth would only be reduced by 0.06% if we diverted enough economic resources to avoid global warming above 2C. BTW, have you checked the temperatures in other parts of the world? We’re still setting record global average temperatures. But your “totaled car” analogy doesn’t fit at all. A more fitting analogy would be: Suppose your insurance company notifies you that in 2114 your great-great-grandson will wreck an expensive automobile, and their estimate of the future damages is $2,874,315. They admit that this estimate is based on flawed computer models that can’t be validated and have never proven very accurate in the past, but even so, they expect you and your descendants to pay higher premiums, effective immediately and for the next hundred years, to defray their losses. Any sane customer would refuse to pay, and would switch to a different insurance company, one that is not run by crooks. Of course, if we give the kleptocrats at the UN the power to charge us carbon taxes, we won’t have the option to switch. 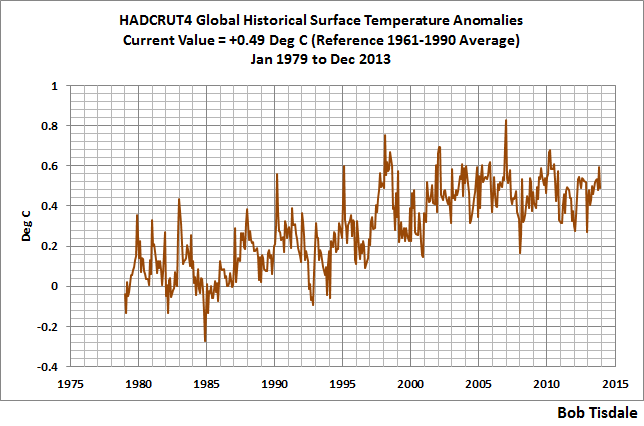 And by the way, yes, I have looked at global temperatures. 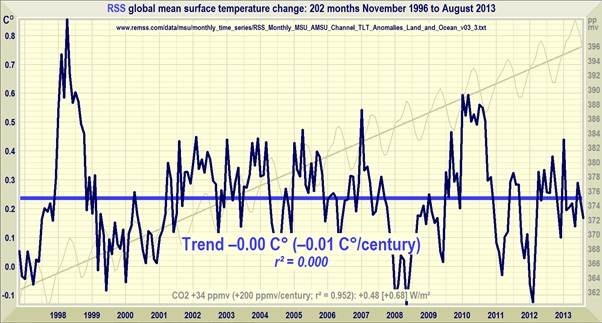 They show no sign of warming for more than fifteen years, despite rising GHG levels. And from the 1940s to the 1970s global temperatures fell, despite rising GHG levels. Until someone shows a quantifiable correlation between GHG levels and global temperatures, there is no way the IPCC can know what economic resources will be required to control temperatures. But then, the IPCC’s real mission has nothing to do with climate. Actually, no we are not, at least according to HadCRUT4 and RSS. Climate is a minimum 30 year phenomenon. Any period less than this is not meaningful from a climate perspective. I wouldn’t get too excited about your “pause”. According to Dr. Ben Santer, 17 years made the “pause” (plateau) significant. Of course, if you wish to go back further, we could analyze the accuracy of Dr. James Hansen’s presentation during the Wirth/Hansen “warm hearing room” trick before the Congress in 1988. Is the difference between his scenarios and the “adjusted” data meaningful, or do we have to wait another 4 years for that? Even my UN climate friend cringes these days when apparently learned people talk about ‘avoid warming above 2 C’ or ‘global average temperatures’ (and the science is apparently also not settled what was first, CO2 or warming?). Before gambling our future and trillions on such abstract absolutes. Let s first settle by whom, how, when and where these data are produced, precision, accuracy, repeat- and reproducibility tolerances set. And who is the arbiter to tell us what the exact ‘average’ world temp is and when – if there is such a thing at all. And to get a bit practical: not far from the IPCC secretariat is a place called La Brevine in the Jura mountains. In winter it can get minus 40 C, in summer plus 30. So when have the Al Gores of this world achieved their goal? When it gets less cold or warmer in La Brevine, in ‘average’, of course. Meaningless, no? By the way, some of the highest precision instruments are manufactured there, people living there permanently, adapting to a 70 C variance. And lets not discuss sea level with people in St Malo, coping with 12 m tides as a matter of course. The moral case for an individual consuming fossil energy and imposing the associated footprint is quite different than the same question in the context of a multinational corporation. The fact is that to avoid or even minimize fossil fuel consumption as an individual incurs opportunity costs. Most of these costs are some variation reducing the potential for that individual to participate in society’s activities (if only because they spend more time getting from point A to point B, though there is far more too it than that). For a corporation like ExxonMobile, it’s quite a different equation. It is historical fact that the oil companies (along with car, tire and other manufacturers) conspired in order to create an infrastructure which maximizes their profits by increasing the opportunity cost to citizens for avoiding their product. Modern urban and suburban design is one of the many legacies of this effort. An individual cannot, through their own personal choices, do more than reduce their (individually tiny) impact to zero. A corporation can, though it’s choices, change the context of choices which are available to citizens in places where it does business. The usual response to this is to cite the corporation’s duty to provide increased shareholder value. Except that this “duty” is a pernicious lie. There is no such legal duty, merely a cultural expectation. And that expectation leads us to today, where large companies have made it nearly impossible for private citizens do anything other than destroy the basis for their own children’s prosperity while attempting to go about their daily lives, and this is considered acceptable business as usual. I am not arguing about why the situation is what we have. But as long as individuals continue to justify using fossil fuels because of the opportunity costs, ExxonMobil will have ample justification to continue producing them. How about the countries that are developing? Why do you think they are increasing their oil consumption? Certainly the oil companies did what they could to foster demand for oil early on, but it seems that all developing countries — as they start to develop — do so by increasing oil consumption. Correlation does not equal causation. It’s entirely possible for a country to increase its standard of living without consuming oil. The likely causes for this increase are a) the most readily available/affordable tools for development are oil-dependent because they originated in oil-dependent societies, and b) people in developing countries can now afford “nice-to-haves” like cars that aren’t necessary conditions for development. Good luck using that argument in China, India or Brazil. $100/bbl. End of the argument. “Except that this “duty” is a pernicious lie. There is no such legal duty, merely a cultural expectation.” Google “shareholder lawsuit” to find a practically unlimited record of corporations being found by our court system to be in breach of their fiduciary duty to shareholders when they’ve acted in ways not intended to increase shareholder value. Further, if there are actions that can be but are not taken to increase shareholder value, an entreprenurial arbitrageur (in some circles known as a “corporate raider”) such as Carl Icahn will appear on the scene to force the firm to take such actions. So it’s both a legal duty and a survival strategy for a corporation to act to increase shareholder value. It’s an historical fact, eh? Acknowledged by who? Nobody really wanted huge houses in the suburbs, did they? (Cue spooky music) Until the boogeyman came along and had their brains for dinner? An the fact that it’s an historical fact means that we have no chance to change it at any time in the future? What makes this particular historical fact so different from other historical facts, which seem to have little or no bearing on our future decisions? Snap out of it, GE! The it’s a big conspiracy hypothesis is driving you (and your readers) nuts. And it leaves everybody feeling helpless and angry. The simple explanation is that even at $100/bbl there are no feasible alternatives to oil (yet). Energy independence, yes, alternatives, no. And whining about it won’t change anything. to developing economies to generate electricity. The nation will go broke quicker if we attempt to regulate every ounce of GW pollution. Were currently focusing on the trees not the forest. There is no excuse to fuel up on petrol as there is no practical choice per majority of auto owners. All alternative fuels involve a compromise to the standard petrol vehicle. Extra cost, slow refueling, limited range, expensive alterations, limited refueling infrastructure, etc. Also, there is an advantage to ownership of an established business with long history of supplying fuel supply needs. Consumers are resistant to change unless the incentive is large enough to overcome the change risk. It is easy to scare motorist away from ethanol fuel use per this human trait. This condition is also upon the U.S. dollar as the currency can claim preferred status per history. It’s a great advantage to the point the advantage evaporates and evaporate it can. Environmentalists claim we need to act now to protect the environment for future generations. They want costly alternatives and need them quickly. Funny, these environmentalists appear to want a hyper expensive Manhattan Project, all hands on deck, and for the public to forgo higher lifestyle to achieve limits on CO2, but these environmentalist working within public good are totally o.k. with the more toxic national debt threat. The debt is of more immediate concern and larger danger to country. Ironic that we spend deficit dollars to eliminate climate change (impossible effort) and think we are safer doing so. Move to SoCal – FCVs being deployed in 2015 using H2 fuel. And hydrogen is usually made from natural gas. So other than being completely impractically expensive, and doing almost nothing to reduce your carbon footprint the point of FCV is? Please don’t spread the misinformation about the deficit – since the dollar floats, and is not pegged to gold (since the 70′s) we need the deficit to grow as much as the real (goods and services) economy grows, otherwise we will have high unemployment and deflation (as has been seen with all the misguided attempts at austerity). The Federal government is the source for all dollars, so doesn’t need to borrow from anyone to get them. Google MMT, Warren Mosler, Stephanie Kelton, Randy Wray, etc. Green Engineer seems to expect corporations to place their first “duty” as that of good corporate citizen ahead of that of resource and profit optimizer. Advocating such an arrangement that places a socially beneficial emphasis on private enterprise often inclines management toward a politicization that tends to invite dubious decisions about resource allocation. Embracing a conspiratorial view of commercial enterprise, to include that of ‘Big Business’ is a slippery slope; arguably the flip-side o those who view anything associated with government as inherently dysfunctional and/or corrupt. Resisting either bias holds the greatest promise of striking a balance that aims to promote productive and profitable benefits that might promote economic well-being. Yes, it is true that myopic public policies have abetted an equally shortsighted orientation in the private sector. To reverse this process, the government should stop placing a heavy thumb on the scale and, alternatively, encouraging competitive forces and the pricing mechanism to work its will in a wisely- regulated marketplace. With all of this said, we must abide the decisions of foreign governments in their own assessment of the trade-offs between economic advancement and the need t protect the health, safety, welfare and happiness of their citizenry. To do otherwise smacks not only of rank hypocrisy, but will quite likely prove counterproductive in the end. There are no easy answers or quick fixes. One thing is certain, the creative forces fostered by economic incentives will remain crucial to achieving the improvements and advancements that we seek in the days ahead. XOM and all other businesses will evaluate future plans/economics for growth. Of most concern to business is to lock in consumers or avoid competition. They prize market share power, patents, good will, inelastic markets/products, profitability, and favorable political environments. So, oil businessmen look to farm ethanol and realize no patents or possibility to control ethanol market. Forget that. critical needs of citizens under the guise of importance to remove industry from vagrancies of open market. Oil is often times commandeered for political corruption. Same with health care. Thanks for the regular upload of BS fresh from the Ethanol Spokeshole. America uses roughly three times as much oil as corn (mass). Corn ethanol has already turned the food market upsidedown. The oil market has yet to take notice. XOM has nothing to fear from corn ethanol, other than what its radicalized supporters may be capable of. And most ammonia today is made from natural gas, I believe. Your point? Human beings have an inborn need for enemies, real or imagined, to vilify and rally against. That’s how our hormones motivated us to commit genocide on competing hunter gatherer bands if the opportunity arose (they were perceived to be evil, less moral). We are not nearly as rational as we want to believe. When it comes to group identity, hormones own us: Oxytocin Boosts Dishonesty. Oil is the dominant energy source for transportation across the planet because it is quite simply the cheapest way to maximize the mobility we all want. And the evidence for widespread genocide against competing bands is what? Or is it just your own trademark version of truthiness? …and I didn’t use the word widespread, whatever exactly that means. Well argue the technicalities if you want. Your post certainly suggested widespread genocide, exact choice of words notwithstanding. I would agree with LeBlanc, the noble savage is a romantic myth. But that’s a long way from routine genocide. The truth is somewhere in-between, I’d say. In Africa some of the tribal warfare probably had more in commmon with modern sports events than with we’d call warfare. With the winners getting to take home the losers’ women. Left myself open, did I? From Wikipedia’s discussion of African military development from 1800 – 1900(1): “Tribal warfare among the Zulu area clans was heavily ritualistic and ceremonial until the ascent of the ruthless chieftain Shaka… Shaka sought to bring combat to a swift and bloody decision, as opposed to duels of individual champions, scattered raids, or light skirmishes where casualties were comparatively light.” Emphasis added. No doubt genocide happened in history, but calling it “standard operating procedure” takes it a bit far. It’s called the internet …a place where you can find arguments refuting everything from evolution, vaccines, to moon landings. Suggesting that inter-group warfare had more in common with “modern sporting events” takes it a bit far. My original comment was to point out why people tend to vilify perceived enemies, conservative, liberal, Republican, Democrat, Big Oil, Big Agriculture and on and on. Go argue your case with the experts, Pinker and Le Blanc. Maybe. But suggesting genocide was routine takes it even farther. I actually agree that vilification is a great strategy for Mr. Bland to get himself elected. It’s called exploiting human nature. It’s a fallen world, and human nature can be very disappointing. And while it is a bit embarrassing that it would work so well in a supposedly modern democracy, it does not say anything about our ability to commit genocide. XOM is in business to accomplish a return on investment money. They attract capital per ROI and future growth potential. They operate under regulation of governing authority. Present day businessmen will invest in politicians per ability to achieve favorable governing status. We incorrectly label the influence “Crony Capitalism” as the politics have little to do with open markets and much to do with power of political government. It takes two to tango; a quid pro quo trade made by elites with power and those willing to pay for it. Conversely, those with power (politicians by definition) will punish those whom don’t like to tango or chose another partner. Supporting partisans get into the act and invigorate the process, they will disparage/attack those whom support the opposition i.e. Twitter, Face Book, and exchanged personal stories a.k.a. fabricated antidotal evidence to diss alternative viewpoints and reputations. Proponents with money or those using their personal influence to support politics will be taken to the banquet, praised for their remarkable talents, and receive heighten score upon the media. Freedom of speech stifled per this power; much to lose within unguarded moment speaking the truth. partisan political support/viewpoints. This newly invented (climate science is relatively new) crisis just smells bad and a growing majority of public think there is a rat in the mix. We should never have to believe a scientific theory. That’s not how science is supposed to work. However, we should act on current theory, per best available explanation. Just, take cost effective and low risk to freedom paths as we need to understand science is not complete in analysis or predictions (just a work in process). GW science can be wrong or inaccurate. No guarantee or absolutes, especially within the soft science of GW. Dr. Ben Santer is climate researcher at Lawerence Livermore National Labs. He specializes in statistical analysis of climate data. He appears sensible with analysis, avoiding the political and emotional. No polar bears, ice flows, or quotes from Algore. He discussed the evidence of climate change. It’s based on an array of international scientist utilizing physical and mathematical analysis. It is incredibly difficult/complex to pick out what he calls a signal appearing from the normal noise of climate variability. Santer is not a pessimist and believes citizens of the planet will understand problem and work to solve. Human activity and CO2 trap more solar heat within atmosphere and reflect less back out. The double chemical bonds of CO2 stretch and vibrate when struck by solar energy and radiate heat. The CO2 content of atmosphere is puny and a mere increase from 265 parts per million to 400ppm along with decreased forest areas and maybe farming practices all the problem? Nature alone incapable of converting our man made CO2, so let’s get over the solutions to reset the land mass clock per ancient forest or prairie lands. Even riding about in battery cars not sufficient. We need active man made management of solar energy. So, we need to reduce heat trapping surfaces, more thermal reflective surfaces. Inventions to harvest CO2 to remove or convert carbon element. We need active man made influence. Depending on our inventions, this may be the entire solution. No need to convert entire energy sector per CO2 accumulation concerns. No need to empower government with total control of life activity. BTW, just read an interesting article of copper alloy catalysis that was cost effective highly reactive to convert cooler temperature CO to ethanol C2H6O. The envisioned fuel process would convert CO2 to CO and then per catalysis process to C2H6O. Cost effective processes decades out. Wow! Lose the fascination with EtOH and we might actually agree on a few things. Why focus on landmass (already in use, smaller fraction of the globe’s surface)? Use iron to fertilize the open ocean and grow algae, which can then be harvested to produce renewable fuel (NOT biodiesel). The leftovers can go to the food chain, assuming we don’t fish the oceans into extinction first. 1)Wind and solar have pretty much reached parity with fossil fuels and their prices will continue to fall. 2) Oil was around $35/barrel in 2003 and is now over $100/barrel. Oil shows no sign of falling prices. Discussions of drilling in the Arctic invites discussion of higher prices. Already, the ability of oil to generate wealth for a society as a whole is waning. 3) The evidence of global warming has simply grown stronger. The science behind the possibility of tipping points is based on the empirical history of past events that go back millions of years. The same geology that made fossil fuels so lucrative is the same geology that warns of global warming in the geological record. Carbon dioxide is a big concern but the crucial issue is methane in the past and the present. The source of growing urgency is methane from warming tundra and warming methane clathrate in shallow Arctic waters. These are feedback effects that are being closely studied. Those who claim that these feedback effects are of no consequence do not appear to have the science to back up the claim. 4. Even if global warming were not a concern, fossil fuels are not the future and haven’t been for some time. Fossil fuels have played their role but they are simply the holding pattern for whatever comes next. We are already in a transition that may take 15 to 40 years. There are many ways such a transition might be handled. But one thing fossil fuel companies can do to protect their investors and their future is to start diversifying at a faster clip. Yes, coal will be under the most pressure but oil will be under continuing pressure from here on out, particularly the riskier, more costly projects. The economic road going forward is likely to be bumpy but much of that turbulence will depend on how far-sighted or short-sighted the oil companies are. 1. Great! Unfortunately there seems to be other issues holding up the implementation of wind and solar, including intermittent supply. 2. Who says anything is waning? Society is happily buying all the oil that can be pumped for the bargain price of $100/bbl. Prices are indeed going up. And why not? Society seems quite prepared to pay more than $100/bbl. 3. Agreed. Sensible solutions, though, remain as allusive as ever. 4. Wait, why does everything always depend on Big Oil? And why does Big Oil need to protect their investors? At $100/bbl and rising, the investors are raking it in, no? Oil has a clear history and still sustains the world economy. But oil is still a mining operation as it was in the beginning. Besides the large profit margins, what did the engineers learn in the late 19th century when they first started using hydraulic cannons for various minerals? That mining operations start playing out much faster, and county by county the mining is closed down and the buildings are shuttered. It’s a lesson that has been lost. But a second lesson is that despite the innovations the prices keep climbing and unless alternatives are found, economies begin to sag. Look at the recent oil stats for North Dakota and Texas. They’re not hard to read. It’s the same message the hydraulic engineers read. As for natural gas, in the late 1930s a study was done that strongly suggested that enough reserves were available that natural gas would last another 500 years. By the late 1970s, those numbers were shown to be overly optimistic. If you wish, I’ll play the pessimist and you can play the optimist and pretend that fossil fuels will last another 426 years. But I’ll be listening to the numbers. You gotta be kidding me: isn’t life tough enough without making a conscious decision to be pessimistic? No doubt a lot of fun can be had with people who made wrong predictions, on both sides. Let’s not forget that Peak Oilers have been warning that we’re running out of oil since the early 20th century. They’ve been wrong for 100 years, but just you wait, mister, the next 5 years will prove them right. This is where the pessimism thing gets me. Do these guys really want to see civilization fail so they can tell their grandchildren: “I was one of the few who saw it coming…” Talk about sad. Actually the last 5 years show what Peak Oilers don’t understand: economics. In fairness, few do.Not that long ago, a lot of Peak Oilers confidently announced to all who would listen that Peak Oil was here, and the decline started NOW. Somehow that didn’t happen, and oil production continues to grow. What happened? In a word: $100/bbl. At that price oil sands are profitable. That price probably also encouraged investors to fund the development of fracking. In the big picture: a price spike allowed previously unrecoverable oil to be recovered. I expect that event to repeat itself in future. I would certainly hope that 426 years hence we have moved on from using fossil fuels. But if we do, it won’t be due to the fact that we ran out. It would simply mean that at some future price ($500/bbl? $1,000/bbl? $2,500/bbl? $5,000/bbl?) a cheaper alternative would be available. Whether our political system can survive another 426 years is a different question. Oil is at $100/bbl and the world economy is (still) growing. Slowly perhaps, but growing. At what price do the “economies begin to sag”? Allow me to suggest: there is no such price. At $5,000/bbl North Dakota is the richest state in the union, and we all work for ND-based corporations. Other than that, and the smaller cars, nothing changes. BTW, your “lesson that has been lost” is lost on me. Care to explain? “At $5,000/bbl”? Hey, I’d like to be in that one! But alas, it’s just a fantasy. Have you actually looked at North Dakota statistics lately? Have you actually looked at what solar and wind are going for these days? Have you actually looked at the sagging economy of the American middle class? The rich are doing fine. I wouldn’t argue that at all. Duke Energy has figured out how to avoid cleaning up after itself. That certainly improves the bottom line. But you’ve forgotten the effect of oil at a $147/barrel in the summer of 2008. Yes, there were other factors involved in the economic meltdown, but those prices played a significant role. An oil investor will probably do fine for the next two or three years, maybe four or five if they can avoid problems in the gulf. After that, not so good. Not unless oil companies start broadening their portfolios. Actually the sooner they do it, the better. The middle class is indeed taking it on the chin, while Uncle Sam looks for every opportunity to take what little they still have and give it to the rich. That is indeed a problem, but not one that specifically involves Big Oil. CEOs from every industry are in bed with politicians from both parties. While the timing of the oil price spike is convenient for Peak Oilers, it is far more difficult to prove any cause-and-effect relationship. Perhaps because it’s not there. The meltdown was caused by Uncle Sam recklessly forcing banks to lend money to all who had a pulse (“Hey look, even more minorities own houses now…”). The bill finally became due, but again the kind uncle was fast to make sure no rich person suffered any damage. As for you lazy workers in the middle class: Giddy up! I know too much of the banking industry to take your version seriously. And much of it began with outright fraud by mortgage companies spending millions on advertising. One of the most ridiculous aspects of the meltdown were the number of banks willing to look the other way because of the bonuses involved. I know people who got fired because they didn’t play along. As recently as the 1970s, the banks had sufficient integrity to prevent these kinds of fiascos. You remember the S&Ls in the 80s, don’t you? So, back to 2008: George W. Bush and Bernanke were mentally awol for at least two or three years concerning the subprime derivatives, and this was despite numerous complaints coming to their departments (at least at the end Bernanke prevented some of the worst). As for the oil prices, it’s too bad the prices didn’t spike about a year sooner. It would have resulted in a smaller recession. Nevertheless, at $147/barrel, the last domino was in place and the shorters on Wall Street, for better or worse, tipped the row of dominos. If you’re optimistic that oil can be driven to $200/barrel and everything will be fine, let’s just hope not too many people agree with you. As for ethanol, you do read this site, don’t you? Let’s hope Valero has found a profitable niche with a high EROEI, or simply gets out soon enough. Today and the future is solar, wind, geothermal and storage systems. Twenty or thirty years hence, if peasants don’t take control of one of the new Chinese nuclear reactors being built, the credibility of fission might be repaired. Otherwise, maybe in 40 years, we’ll have fusion. Factoid: The Clinton administration wanted to see more minorities own homes, so they leaned on the banking industry to loosen lending standards. The W administration was quite happy to do a victory lap on the increased home ownership of minorities. With the loosened lending standards all bets were off. I’m sure everything you mention is true. But it does not seem to be that any of it would have happened without lo(o)ser lending standards. What am I missing? Wait, the shorters caused the meltdown? How? How does my betting you are going to do something make you do it? Unless you are trying to impress me? And with all the money involved that seems quite unlikely. More likely the shorters simply saw the train wreck that was about to happen, and knowing they couldn’t stop it (as you said, there were no adults around at the time – W is just waiting for the next ballgame to start), simply turned it into a personal profit. As for the effect of oil prices: it was not that long ago that GM stated that $3/gal would be the end of the SUV. We are now comfortably in $3+/gal land, and GM is STILL making money selling overpriced, oversized sedans, aka SUVs. If $3/gal can’t even kill the SUV, no oil price is going to kill the economy. At least not at long as Uncle Sam stays out of the argument. Optimist, the average miles per gallon of American cars has been climbing for the last five years. That means overall lower costs for consumers. Whether electric, hybrid or conventional fossil fuels, cars are now cheaper to operate. Cars, however, were not cheaper to operate in the summer of 2008 when prices were $147/barrel. The prices bit the American consumer rather hard, seriously aggravating the economic downturn that had already started in early 2007 (I’m still astounded that investors ignored the crisis we were in until summer of 2008). President Obama bailed out the auto companies on the condition that they improve overall mileage. The mileage will continue to improve without having to resort to the expansion of fossil fuels. Oil will still be around, but it is essential to get all fossil fuels, including oil, to drop substantially in the next twenty years. Some argue we have 35 years to drop fossil fuels to 50% but I seriously doubt it. Well there’s a loaded statement. Depends on what you consider baseline, I guess. If summer 2008 is baseline, yes, cars are slightly cheaper to run. If you move the baseline to the late 90s, with gas slightly over $1/gal, we now have gas prices easily three times higher. Gas mileage has not come close to cancelling that out. Look, I happen to be in favor of a carbon tax. No problem there. But the point is largely moot for several reasons. Because the economy has fundamentally been stressed repeatedly since American oil production peaked in 1970, the mere mention of a tax is often easy for the political right to manipulate. The more important issue, however, is that if we still have a free enterprise system (some doubt there because of monopolistic behavior and other useless activity), the growing alternative energy businesses are capable of out innovating fossil fuel businesses — and at this point, fairly quickly over the next twenty to thirty years. We can debate the purpose of the mileage standards (and if they are even required; or if they are an efficient way to achieve the goal) until we are blue in the face. The point remains, even at $3/gal few consumers are insisting on high mileage options. If the did, the mileage standards would be irrelevant. If you are waiting for alternative energy to out innovate Big Oil you are in for decades of disappointment: (1) Alternatives are still so expensive they almost laughable; (2) The largest alternatives are food-based – not only a crime against humanity and an incredible achievement in sheer stupidity that Washington increasingly appear to specialize in, but ultimately little more than an under-the-counter subsidy to Big Ag; (3) If a truly viable alternative was ever invented, Big Oil would buy it out in no time – not to squash it, to develop it (they have deeper pockets, better understanding of the market and better engineering capabilities than anybody). Your knowledge of alternative energy is about five years out of date. I don’t blame you — it’s been moving very fast. Wind reached parity a few years ago and solar has reached parity in the last year. This is where the action is with a range of issues from electrical connections to installation dropping rapidly in cost. There are strong indications that storage systems will follow in three or four years, if not sooner (though some practical applications are already economical). To some degree, fossil fuels continue to climb rapidly in prices from what they were just 12 years ago. Although there’s been some leveling off since the fracking boom, the picture going forward doesn’t suggest lower prices anytime soon. In the meantime, the big companies keep having to revise their reserve figures downward. Not good. Going forward, this is not a good picture. Some days I find talk of oil companies buying out alternative energy companies depends entirely on the energy company or owner being discussed. For example, since some of the hotshot wheeler dealers think global warming is just hippy talk, why would they even bother? But the fact of the matter is that several of the majors over the years have indeed been keeping their hands in the business, and in this discussion I have been arguing that they need to diversify even more away from fossil fuels (and not simply buy alternative energy to put it on the back burner and ignore it). But they’re going to have to make some interesting hires as well. They need people in alternative energy who know what they’re talking about. Things are moving very fast these days in multiple areas. Well, great for wind and solar, assuming you’re right. We’ll see soon enough. Fracking is an interesting case study. Caused a rapid collapse of nat gas prices. Terminals built for imports are being converted for export. Killing coal, while the coal industry blames Obama. With liquids (crude) the picture is very different. Fracking is giving the US energy independence, but prices are staying high, due to the fact that crude is an international commodity. Between fracking and tar sands they put a floor under crude prices, so don’t expect prices to come down any time. Quite independent of reserves. Supply and demand, on a global scale. Asia means demand keeps growing. Global warming, for all the heated discussion, is really irrelevant when it comes to investment decisions, at least if you’re based in the US. True, the Europeans (Shell, Total, etc.) can’t ignore it. How did it happen that Europe cares about the environment, while in the US you can’t even pretend to care? I will need to see a cost study before believing solar and wind have reached parity with N.G. or coal power. Read the “Editors Corner” article on the real cost of wind power. Much of the “savings” is due to regulators savaging the coal and nuclear with artificial costs that do little other than to make the competition more attractive. I’ve seen decades of these shenanigans attempting to destroy nuclear power. If ever the environmentalist were truly concerned with global warming fears they would run to, promote, develop, encourage as much nuclear as possible. It’s hard to understand the doomsday scenario fear of global warming. The archeology evidence of prehistoric times were amazingly hot. Methane gas at 1,000x levels of today. Swampland even today produce most of the gas. Volcanoes puked up monumental global warming gases. Back then plants grew startling huge, dinosaurs eating the plants as well, huge. Life was abundant. It appears a meteor hit the planet and dusted up the atmosphere, reflecting sun’s warmth to space. The planet cooled, abundant life shriveled or should I say shivered. Also, seeing that it’s Resurrection Sunday, why are the majority of population whom believe in evolution worried? Even if life extinguished itself present day the Evolutionist Creationists believe life would reset and start from some primordial goo. I’m not sure how to answer you. So let me do it my way. Some twenty-five years ago, if the first President Bush had had a little more luck and a little more backbone, we might have started dealing with global warming and a range of energy issues in a serious way. Sometimes I think the issue for some decades has not been global warming or energy, but simply the erosion of American pragmatism in favor of purchased ideology. I appreciate the problem solving that people in fossil fuels have engaged in for almost two centuries. But rising prices are not a sign of pragmatism. And the lack of bipartisanship on solving problems is not a sign of pragmatism. It seems to me the generation that dealt with the Great Depression and World War II would have had the pragmatism to deal with global warming and energy by now. And most of the research — mind you, another useful kind of pragmatism — that has gone into alternative energy in recent years would have been done years earlier (say in the 80s). I admit, though, that conservatives have allowed research and changes in efficiency to occur, though much more research could have stretched the value of fossil fuels, not just for the corporate bottom line, but for everyone. Without efficiency, we would be in far more trouble today. We could use more of it. Oddly enough, a nice fossil tax might actually lead to lower fossil fuel prices when more efficient systems kick in. But ideology trumps pragmatism. The ‘science’ you lay out doesn’t have much science behind it. Volcanic eruptions, for example, even the mega volcanic types like Yellowstone, still do not put out as much carbon dioxide as humans are doing. A hundred box cars or so a day to power a single coal plant 365 days a years for 50 years is not trivial. Multiply that by all the other sources of CO2 and your assertion has no legs. Large emissions of methane in the past, if you actually read the literature, are at times associated with major extinction events. Those emissions, incidentally, are preceded by rising carbon dioxide levels. We have time to deal with emissions. But it’s simply smarter to turn to cheaper energy as quickly as possible. We can solve two problems for the price of one. And that’s not a bad bargain. Bush is not responsible for global warming. U.S. handled the Great Depression horribly, but a magnificent exercise in empowering politics. Prehistoric times had no mass extinction with 1,000x levels of methane, until sudden chill of meteor strike blocking sunshine. Human activity will result in additional CO2 as nature has little ability to convert the gas pass nature’s ability to make the gas. We could minimize the rate of acceleration of CO2 accumulation per solar, wind, biofuel, biomass, and nuclear but the gas will still accumulate to higher levels. We need active processes to convert CO2. sympathy, and enjoying home brew intoxicants, drug use, and welfare benefits to live the life. No cars, guns, tobacco, attempts to make a better living, or improve moral standards. Just beautiful, happy, healthy, and humorous people living the life. In spite of the cost, driving is still VERY popular, suggesting it is not SO expensive after all. May just not yet. Love you peak oil scenario: almost sounds worth looking forward to. I don’t really know what Exxon Mobil owns, but I am guessing that their declining reserves consist mostly of easy, conventional oil which should be used in preference to extra heavy oil, arctic oil and similar expensive resources. citizens developing appetite for beef. It’s a supply demand cost. Train transport greatly affecting cost of stapes including ethanol. Pipelines not available for crude oil transport and oil companies utilizing railroads. R/R traffic has tripled in some few years. Another reason to build the XL pipe line, cost of food. Please allow me the opportunity to spout a few factoids to challenge your charges and statements of which you believe so strongly about. 1 single volcano eruption discounts and dilutes all facts and justification claims about climate change. Its simply a money wheel for taxes and gouging into our pockets. The numbers don’t add up, the more credulous scientific data that has been purported as scientific truths actually has been proven to have been manipulated lies. Like I say – 1 volcano eruption emits more toxic gases and heavy metals into the air than our entire historical addition of pollutions since the industrial revolutions of our world began. I am not saying we do not need cleaner air and water and that we should ignore pollutants and those who pollute. What I “AM”: saying is that global warming has been brainwashed into the less knowingly educated of our population and the climate changes you see happening have been happening for millions of years with or without us as Homo Erectus, without our contribution to climate change. Read up people [sheople] get educated and see what the REAL scientists are saying about climate change. You will find direct reference to volcano eruption and the massive quantities of gaseous and heavy metals have a impact on what others are loosely describing as climate change. Come on – don’t you get it – its mother nature and what she has been doing for millions and billions of years. Its an eco-system. What’s next (?) – are we going to fund efforts to cap off all volcanos to prevent climate change – absurd you say ? – well take a second look at what your repeatedly spouting off about oil companies and their ill effects to our world. Volcanos have emitted much more damage than oil companies. And I bet YOUR facts do not stop you from sticking the hydrocarbon fuel nozzle into your tank on the way to work, or stop the school buses from carr6ying your children to school, or stop you from taking a vacation because your worried about the carbon foot-print you will leave in your wake. It certainly does not stop the Obama’s from taking their jet-setting million of carbon weighted vacations either (?) Anyone that follows a singular train of thought spouting off that oil companies are the reason we have climate change and not taking all considerations into account are simply “sheople” – defined as people following the rest of the herd sheep herd that bahhhhh all day long just bcoz the other sheople next to them is doing the same.